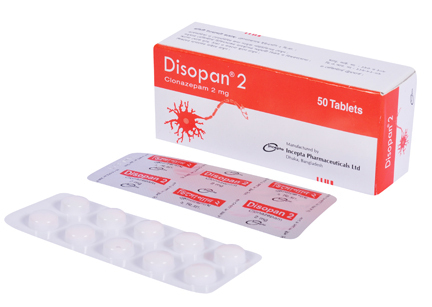 Disopan 0.5 : Each tablet contains Clonazepam USP 0.5 mg.
Disopan 1 : Each tablet contains Clonazepam USP 1 mg.
Disopan 2 : Each tablet contains Clonazepam USP 2 mg.
Disopan 1 injection: Each vial contains Clonazepam USP 1 mg in 1 ml solution. Initial dose: 0.01 - 0.03 mg/kg/day. Up to 1 year: 0.25 mg daily in divided dose, not to exceed 0.05 mg/kg/days increase gradually to 0.5 - 1 mg.
Increment dose: not more than 0.25 - 0.5 mg 1 - 5 years: 0.25 mg daily in divided dose, at intervals of 3 days increase to 1 - 3 mg.
Dosing interval: b.i.d. / t.i.d. increase to 3 - 6 mg.
Dosing interval: b.i.d. / t.i.d. Infants and children: half of a vial (0.5 mg) by slow IV injection or by IV infusion. Adults: 1 vial (1 mg) by slow IV injection or by IV infusion. This dose can be repeated as required (1 - 4 mg are usually sufficient to reverse the status). In adults, the rate of injection must not exceed 0.25 - 0.5 mg per minute (0.5 – 1.0 mL of the prepared solution) and a total dose of 10 mg should not be exceeded. Slow intravenous injection: The contents of the vial must be diluted with 1 mL of water for injection prior to administration so as to avoid local irritation of the veins. The injection solution should be prepared immediately before use. IV injection should be administered slowly with continuous monitoring of EEG, respiration and blood pressure. 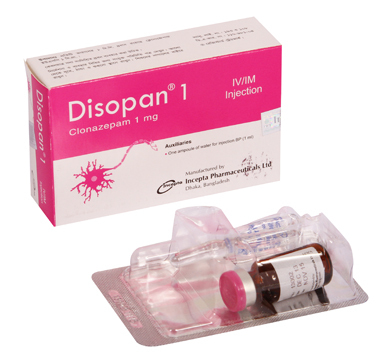 Intravenous infusion: Clonazepam (the vial) can be diluted for infusion in a ratio of 1 vial (1 mg) to at least 85 mL diluting media. The diluting media can be any of the following: sodium chloride 0.9%; sodium chloride 0.45% + glucose 2.5%; glucose 5% or glucose 10%. These mixtures are stable for 24 hours at room temperature. Infusion bags other than PVC should be used for infusing Clonazepam. If PVC infusion bags are used then the mixture should be infused immediately or within 4 hours. The infusion time should not exceed 8 hours. Do not prepare Clonazepam infusions using sodium bicarbonate solution, as precipitation of the solution may occur. Intramuscular injection: The IM route should be used only in exceptional cases or if IV administration is not feasible. 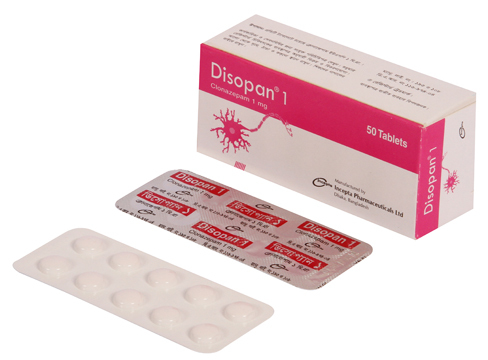 Some side effects, like: fatigue, muscle weakness, dizziness, somnolence, light-headedness, ataxia, restlessness, hypersalivation in infants, paradoxical aggression, reduced co-ordination may occur with Clonazepam therapy but these effects are transient and generally disappears in the course of the treatment. Respiratory depression may occur in patients with pre-existing airways obstruction, or brain damage, or if other medications which depress respiration have been given. As a rule, this effect can be avoided by careful adjustment of the dose to individual requirements. The abrupt withdrawal of clonazepam, particularly in those patients on long-term, high-dose therapy, may precipitate status epilepticus. Therefore when discontinuing clonazepam, gradual withdrawal is essential. Clonazepam may produce an increase in salivation. This should be considered before giving the drug to patients who have difficulty handling secretions. Because of this and the possibility of respiratory depression, clonazepam should be used with caution in patients with chronic respiratory diseases. The concomitant use of Clonazepam with alcohol and CNS depressants should be avoided. Such concomitant use has the potential to increase the clinical effects of Clonazepam, such as: severe sedation, respiratory and cardiac depression. In some cases, dose adjustment of other medications is necessary. Clonazepam may produce an increase in salivation. This should be considered before giving the drug to patients who have difficulty handling secretions. 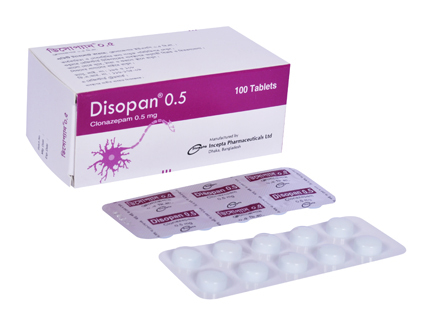 Clonazepam is adviced to use with caution in patients with chronic respiratory diseases. Because of the possibility that adverse effects on physical or mental development could become apparent only after many years, a benefit-risk consideration of the long-term use of clonazepam is important in pediatric patients. The use of clonazepam during pregnancy or lactation should be avoided. Clonazepam is excreted into the breast milk and should therefore be avoided in breast-feeding mothers.